Editor’s note: NAMA received two review copies of this book, so it seemed appropriate for us to prepare two independent reviews. This 265 page hardcover 8.5"x11" book is a visual feast that I keep on my coffee table and take to show off at lectures about fungi. 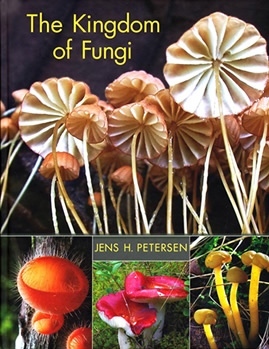 The author, Jens H. Petersen, is a mycologist who has taught for over twenty years at Denmark’s Aarhus University and has collected fungi in many parts of the world. He is a photographer who has mastered photography from the macro scale to the micro scale. Each page of the book is dominated by splendid photography with text taking up at most about 1/8 of each page. After the preface, the book begins with an introduction to the fungal life cycle (2 pages), a section on the diversity of fungal spores (4 pages), and illustrations of hyphae (6 pages). The author then discusses kinship and classification within the fungal kingdom (6 pages), delves into "the perfect imperfects" (10 pages), and explores the diversity of fruiting bodies (12 pages). The Ascomycota are covered in a 56 page segment followed by a 90 page segment on the Basidiomycota and 2 pages on the Zygomycota and other groups. Each section is beautifully illustrates the diversity of both macroscopic features and microscopic features of the fungi. Fungal ecology is covered in a 26 page segment followed by a 34 page segment on "fungi in the world" that describes where fungi are found and why fungi are important. The closing 6 pages reveals how much re- mains to be learned and why it is important to protect fungi. This book would make an excellent addition to the NAMA school teaching kit. The pictures will enthrall young children and the text is both easy to understand and informative. Even after decades of studying mycology, I discovered new material and interesting material. When agreeing to review the book, I thought that I would be reviewing a college textbook on the fungi. Indeed, I would have college mycology students buy the book as part of their course — the text will give them a succinct over-view of the fungal kingdom and the pictures will give them the visuals that are so lacking in their college textbooks. However, I will also want to introduce anyone from 6 years old to 100 to this book. It contains both sound science and visual humor. At $29.95, it is a bargain. This review was published in the July-August 2013 issue of The Mycophile. Jens Petersen is a Danish mycologist whom, until now, I had known only through his excellent field-guide photographs, which appear prominently in the identification software program, MycoKey, as well as in many European mushroom books and online sources. However, his new book has expanded and elevated my already high opinion of his work. Given its heavy emphasis on the photographs, this is probably best categorized as a coffee table book. Nonetheless, the text, albeit sparse, is highly informative and furnishes something of a synopsis of a mycology textbook. The short snippets (one to three paragraphs each) provide an accurate overview of a wide range of topics and should lead many readers to seek out additional sources of information to flesh out their understanding. General coverage includes an introduction to fungal life, fungal spores, hyphae, taxonomic relationships (“kinship”), imperfect fungi, fruiting bodies, fungal ecology, where fungi occur (or don’t), why we need them, and what the future holds. This comprises about one-quarter of the book. The remainder is devoted to an annotated pictorial tour of the ascomycetes, basidiomycetes, zygomycetes, and other groups with overwhelming emphasis on the first two. For overall quality and sheer beauty, most of these photos are as good as any I’ve seen. The treatment strikes a good balance between the traditional morphological classification scheme and the findings of recent molecular phylogenetic studies that attempt to produce a scheme that follows the evolutionary relationships of the organisms. I am particularly impressed by the range of scale in Petersen’s photography. Not just the usual field guide photos of decent-sized mushrooms, but everything from landscapes to tiny cups to microscopic features, all done in excellent fashion. And, not only are the photos beautiful but they are showcased in an equally attractive package created by the design team. No stodgy textbook this. The charts are colorful, clearly laid out, and integrated nicely with the photos. With a very reasonable price, there is no reason for every mushroomer not to have his or her own copy and perhaps to buy additional ones for eye-opening gifts for friends who don’t yet share our passion for the fungi.